The vision of building a Catholic Church in the east side of Kamloops came to His Excellency Bishop Exner in 1981, when a site near a picturesque apple orchard was deemed to be the location for such a place for God’s people. 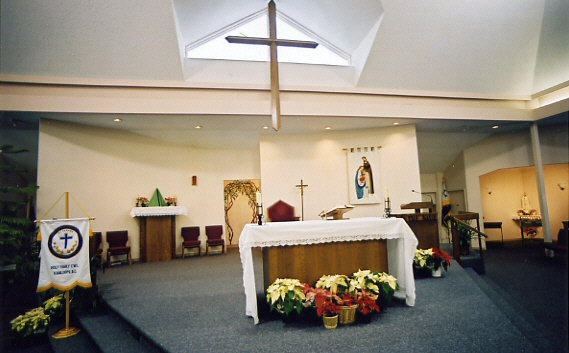 Presiding at the sod-turning ceremony on Sunday July 25, 1983 was the Most Reverend Lawrence Sabatini, CS, who also presided at a Solemn Mass at the official opening and blessing of the Parish Centre on Wednesday, June 27, 1984. It does seem almost impossible that we all fit into what is now known as the “foyer” to celebrate Mass! The Church as we know it today was officially dedicated by Bishop Sabatini on the Solemnity of Corpus Christi, Sunday June 5, 1994 when twelve priests concelebrated Mass and three seminarians were among the 500 people present. Priests who have served at Holy Family have included Rev. Ernest Kamath, Rev. Albino Rodriquez, Rev. Jerry Desmond, Rev. Emil Sasges, Rev. Dr. Michael Saunders. Rev. Dale Normandeau acted as the parish admininstrator in 2001, while the priests from the Cathedral, including Rev. Joseph Dahlem and Rev. Derrick Cameron, were serving Holy Family Parish. Rev. Derrick Cameron was subsequently named as parish administrator until 2005 when Rev. Nicholas Forde, O.M.I. served until July 2010. Fr. Fred Weisbeck is currently the parish administrator.